CricViz Analysis: Who Makes Strongest Case for IPL Glory? The 12th edition of the Indian Premier League (IPL) is set to commence on Saturday (March 23) when defending champions Chennai Super Kings led take on the Royal Challengers Bangalore. The clash between the sides led by MS Dhoni and Virat Kohli respectively, is a mouth-watering one but the nature of the cash-rich franchise league is such that no match is likely to be a dull affair. Here is an analysis on the strengths and weaknesses of all the eight sides who will participate in the tournament this year. 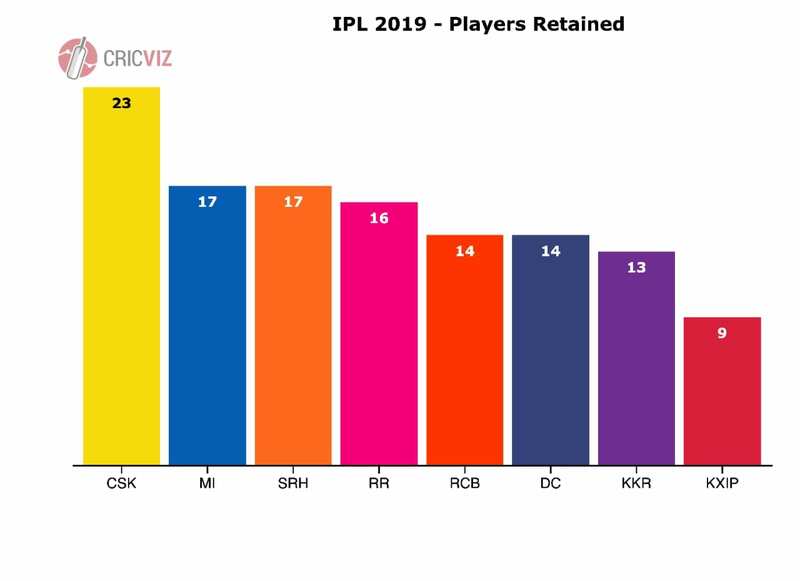 Stability and familiarity - CSK retained 23 of their players from last season - the most of all teams. This year they have a squad who are familiar and are comfortable with their roles in the team. Versatility - Last season CSK demonstrated their versatility by winning the IPL despite being forced to move from their spin-friendly home stadium in Chepauk - which they had built their squad around - to a pace-friendly stadium in Pune. With an almost identical squad this strength will be maintained. Solid top order - CSK’s top order is solid but unspectacular with Shane Watson (+0.70), Suresh Raina (+0.55), Faf du Plessis (+0.30) and Ambati Rayudu (-0.22) more often than not providing solid starts. Recently du Plessis has shown some evolution to his game which could see him elevate his scoring rate and provide faster starts more regularly. Watson has been in terrific form in the last 12 months. Lower order hitting - CSK’s lower order is a concern. Dwayne Bravo (projected batting impact -0.17), MS Dhoni (-0.19), Ravindra Jadeja (-0.99) and Sam Billings (-1.58) are all negative impact batsman. Last season Dhoni rolled back the years with the bat and he may need to do the same again if CSK are to capitalise on the top order platforms. 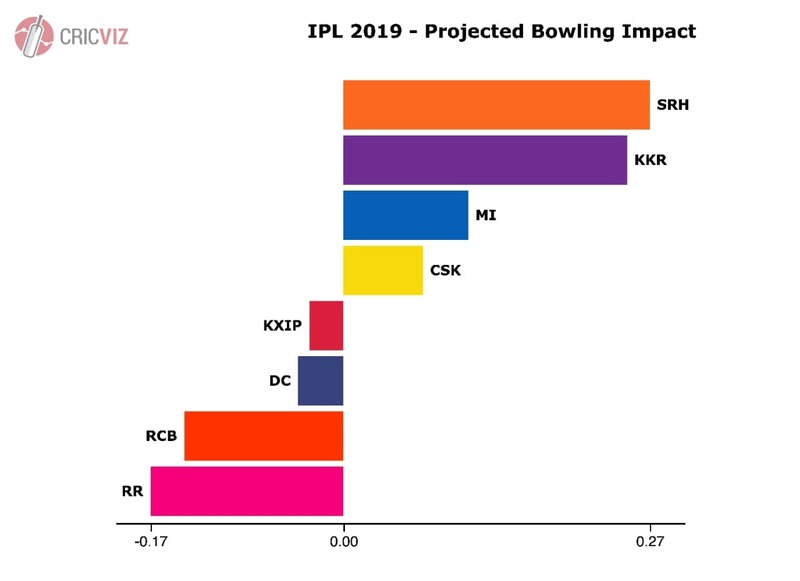 Pace bowling - The only pace bowler in CSK’s squad with a positive projected bowling impact was Ngidi (+0.51) and he has since been ruled out of the season with an injury. Ngidi’s absence is a huge blow to CSK. The rest of the pace attack is new signing Mohit (-0.06), Chahar (-0.27), Thakur (-0.70), Willey (-0.79) and Bravo (-0.79). Last season death overs bowling in particular was a major concern with CSK registering the second highest economy rate in the phase. This is a big season for Bravo who had the worst IPL season of his career last year. Ageing squad - Last year the experience of CSK’s squad was seen as one of their strengths and in some situations it will add value. However, players decline with age and CSK’s squad has five players over the age of 35 and seven more older than 30. Whether they can continue to operate at their peak levels remains to be seen. Indian batting - Delhi have one of the best Indian batting cores in the IPL with Shikhar Dhawan, Prithvi Shaw, Shreyas Iyer and Rishabh Pant. This will give them versatility with their overseas players, allowing them to bolster their weaker lower order and bowling. Overseas bowling - Delhi’s overseas bowlers are proven international performers. Chris Morris (projected bowling impact +0.91) and Kagiso Rabada (+0.28) are notably stronger than Trent Boult (-0.70) who does at least bring left-arm variety. These quicks are joined by Lamichhane (+1.81) as the overseas spinner. Rabada will miss the backend of the IPL to join South Africa’s World Cup squad but Morris - who had a poor IPL last year but a brilliant one in 2017 - could well miss out on World Cup selection and could be a key player for Delhi with bat and ball. Spin bowling - Lamichhane (projected bowling impact +1.81), Axar (+0.85), Mishra (+0.81) and Tewatia (+0.36) form a very strong spin bowling quartet. All four of these spinners all take the ball away from the right-hander and they may struggle against left-hander heavy teams. 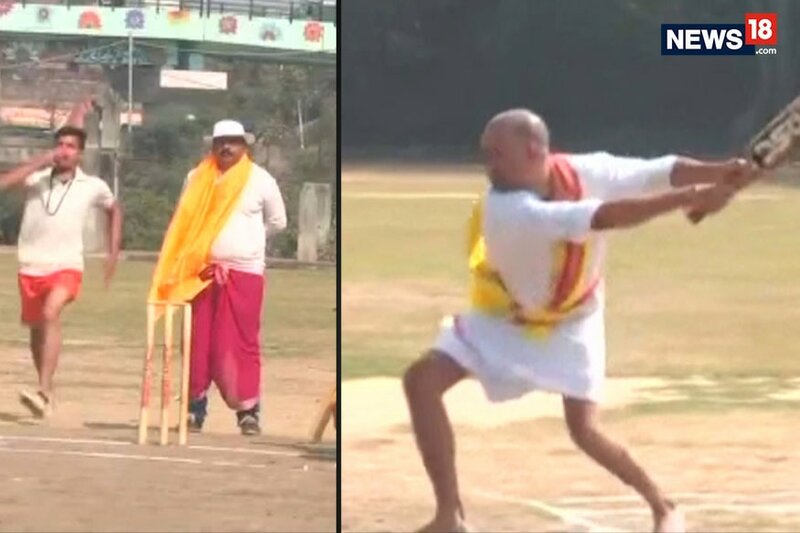 Saxena’s part time off spin (+0.03) is the only Delhi option for someone to take the ball away from the left-hander. Indian pace bowling - Delhi don’t have a single Indian pace bowler with a positive projected impact, something that should be a major cause for concern. Ishant (-2.25) continues to be signed to the IPL despite very little pedigree in the shortest format. He is joined by Harshal (-0.94), Avesh (-0.65) and Nathu Singh (-0.12). Delhi will be heavily reliant on their spinners and overseas quicks with the ball. Lower order batting - Delhi’s powerful top order is likely to be supported by one of Ingram (projected batting impact +1.66) or Munro (+2.62). Below them will be a lower order of great potential but possible inconsistencies: Morris (+1.16) can be a very dangerous batsman while Axar (+0.21) is also a strong player. Neither of these two players, or Tewatia (-0.52) have yet shown themselves capable of consistent performances. Whether they can could prove to be the difference between a Play Off finish or not for Delhi. Vihari (-1.24) has not yet shown he has the game for T20 cricket. Squad structure - KKR have a small squad with a clear structure. Lynn (projected impact +1.52), Russell (+2.36) and Narine (+3.61) are the three frontline overseas players with Ferguson (+1.65), Gurney (+0.35) and Nortje (-0.63) vying for the overseas pace bowling spot. Powerplay batting strategy - KKR have a very clear batting strategy with Lynn, Narine and Uthappa tasked with maximising the benefits of the Powerplay fielding restrictions. KKR are committed to this strategy: last season no team attacked a higher proportion of balls in the phase than KKR’s 61% and although this contributed to the second lowest Powerplay dismissal rate in the league of 22 balls per wicket it also produced the highest Powerplay run rate of 9.12 runs per over. World Cup call ups - The only KKR player who may have to leave their squad early for World Cup preparation is Lynn and he only remains an outside chance to make the Australia squad. The remaining overseas players are either out of favour with their international team or likely to be permitted to play the entire IPL season. Spin attack - Narine (projected bowling impact +4.10) is the second highest projected bowler in the league and Kuldeep (+2.42) is the fifth. No team’s best two spinners are as strong as KKR’s. Kolkata also have Chawla (+0.18) to call upon as well. Last season 54% of KKR’s overs were bowled by spinners - the highest proportion of all teams. Squad depth - KKR’s small squad should help with consistency of selection but if they get injuries to their key overseas players they lack depth. Denly (-1.87) and Brathwaite (-1.01) are poor back-up options for Lynn and Russell. KKR are at least well-stocked in the spin department with Kuldeep (+2.52) and Chawla (+0.18) to take up spin overs in the absence of Narine. 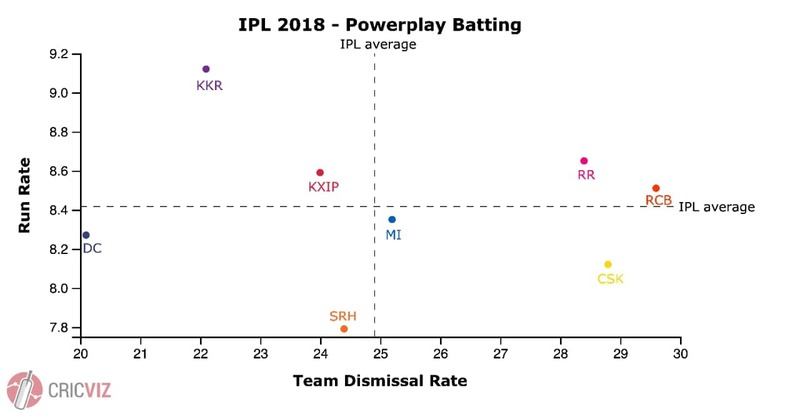 Powerplay bowling - Last season KKR had a major problem taking wickets in the Powerplay with an overall strike rate of 44 balls per wicket in the phase. This season they’ve added three new overseas quicks: Nortje and Ferguson should help remedy the problem but Gurney is a lot stronger in the closing overs. Indian pace bowling - Last season KKR’s Indian quicks had the third highest bowling economy rate of any set of Indian pace bowlers. This season they have not made any major additions in this department, sticking with the promise of youth with Krishna, Mavi and Nagarkoti, the latter two have already been ruled out of the season by injury. KKR’s overseas quicks will be carrying considerable responsibility. Opening partnership - Gayle (projected batting impact +2.77) and Rahul (+2.36) are a very dangerous opening partnership. Last season they scored 1,026 runs between them at a run rate of 9.18 runs per over. Spin bowling - Mujeeb (projected bowling impact +2.50) and R Ashwin (+1.52) are KXIP’s top two ranked bowlers. Leg spinner M Ashwin (+0.06) and new signing Varun Chakravarthy - who is yet to play a full T20 match but is a highly regarded mystery spinner - are also options. Last season 44% of KXIP’s overs were bowled by spinners - the second highest proportion of all teams behind KKR. This season that proportion may be even higher. Bowling depth - After Mujeeb (+2.50), Ashwin (+1.52) and Tye (+1.19), KXIP’s bowling is alarmingly short on depth. Mohammad Shami has recently displayed excellent white ball form for India but has a woeful T20 record (-2.52). KXIP spent a huge amount of money on Curran who also has a poor T20 record (-0.88). Other bowling options include M Ashwin (+0.06), Ankit Rajpoot (-0.24) and Hardus Viljoen (-0.61). All rounders - KXIP are going to struggle to balance their team with a lack of strong all rounders. Henriques (projected impact -1.29) and Curran (-1.20) are two overseas options but neither are particularly good options while the Indians Agnivesh Ayachi, Varun Chakravarthy and Harpreet Brar have never played a T20 match and Darshan Nalkande has played just three (-0.54). None of KXIP’s frontline batsmen - Gayle, Rahul, Nair, Agarwal, Mandeep or Sarfaraz - could provide a bowling option either. Overseas picks - The lack of all rounders is going to complicate KXIP’s four overseas picks. Gayle (projected impact +3.01) and Mujeeb (+2.19) are certain starters. Tye (+0.51) should also start to bolster KXIP’s otherwise weak bowling. If KXIP had solid Indian all round options they could play Pooran (projected batting impact +1.07) or Miller (+0.16) to strengthen the lower order batting but they may have to expend an overseas pick on Curran or Henriques to balance the team. 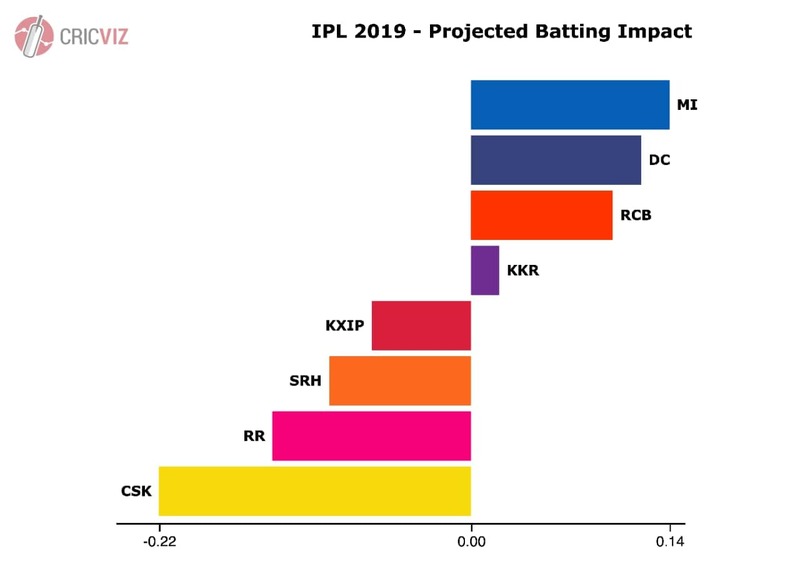 Batting - Mumbai’s overall projected batting impact of +0.10 is the best in the league. Lewis (projected batting impact +2.80), de Kock (+1.51), Pollard (+1.31), Krunal (+1.26), Suryakumar (+0.57), Cutting (+0.51), Rohit (+0.31), Hardik (-0.01) and Kishan (-0.54) is an exceptional batting core. Pace bowling - MI’s pace bowling attack is one of the strongest in the IPL. Milne (projected bowling impact +2.95) is the top ranked pace bowler in the league, while Bumrah (+2.19) and Malinga (+2.18) are the third and fourth ranked quicks and Behrendorff (+0.64) is the ninth. McClenaghan (-0.85) is the weakest of the overseas bowlers. Mumbai’s Indian pace bowling depth with Sran (-1.58) and Hardik (-1.17) is not great but their core strength is exceptional. Squad structure - Mumbai’s squad structure is clear and well balanced. They have an exceptional Indian core of Rohit, Suryakumar, Krunal, Hardik, Kishan and Bumrah and two overseas players for each role: Lewis and de Kock at the top of the order, Cutting and Pollard as all rounders, Milne and Malinga as right-arm quicks and Behrendorff and McClenaghan as left-arm quicks. Spin bowling - Krunal (projected bowling impact +0.68) is a reliable performer at IPL level but a lot of responsibility rests on the teenage leg spinners Markande (-0.07) and Chahar (+0.02) in the role of the attacking spinner. Jos Buttler - Buttler is Rajasthan’s best player (+1.04) and comes into the season in brilliant form. Last year his five consecutive fifties propelled Rajasthan to the Play Offs. Similar heroics may be required this time around as well. Settled overseas core - Rajasthan are likely to select Buttler, Stokes and Archer as three of their four overseas players, with Sodhi and Thomas fighting for the second bowling spot. Although Stokes is not anywhere near the T20 superstar his huge auction fee suggests this settled core will provide the team with a clear structure. Home pitch - Last season the pitch in Jaipur was slow and low. This may not suit overseas batsmen Stokes and Buttler but Rajasthan’s domestic batting - the likes of Rahane and Samson, and potentially Smith as well - may be well suited to grinding out competitive totals. Lack of match-winners - Rajasthan are the weakest team in the IPL this season. Their squad is conspicuously lacking major match-winners. 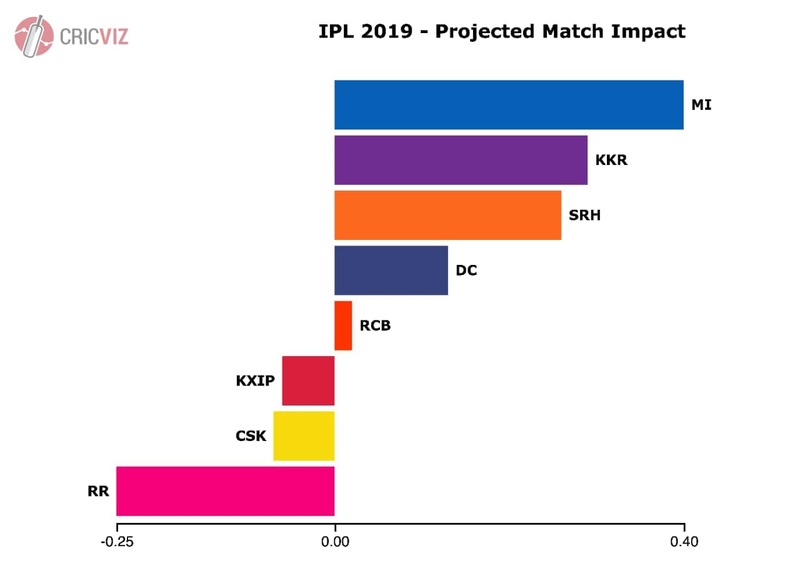 Their only player with a projected match impact of more than one is Buttler (+1.04) and they only have five players with positive projected impact: Gopal (+0.48), Sodhi (+0.39), Kulkarni (+0.14) and Archer (+0.06). Weak Indian contingent - Rajasthan only have five positive impact players and just two of them - Gopal and Kulkarni - are Indian. In Vohra (-0.13), Rahane (-0.14), Gowtham (-0.15), Samson (-0.16) and Tripathi (-0.28). Rajasthan have a number of Indian players with minor negative impacts. Unless they can all over-perform Rajasthan are going to be heavily dependent on their overseas players. Pace bowling problems - Archer (projected bowling impact +0.25) and Kulkarni (+0.20) are strong bowling options but Stokes (-0.79) , Aaron (-0.86) , Unadkat (-0.97) and Thomas (-1.33) are all considerably weaker. Thomas is at least at the start of his career and has room for improvement while Unadkat has had one excellent IPL. They are going to need at least one of these quicks to excel. World Cup call-ups - Rajasthan’s are likely to be gutted by World Cup selections which looks set to take Buttler, Stokes and Archer - all certain starters, Smith and possibly Turner from their squad. This will leave them with only three overseas players: Livingstone, Thomas and Sodhi. Rashid Khan - With a projected bowling impact of +5.54 Rashid is easily the top ranked bowler in the tournament. His consistent brilliance makes batting against SRH immensely difficult. He will win matches single-handedly. Bowling - SRH’s varied bowling attack is comfortably the best in the league. They combine a pace attack of similar quality to Mumbai’s - Bhuvneshwar (+2.40), Sandeep (+0.60) and Kaul (+0.29) - with a stronger spin attack - Rashid (+5.53), Shakib (+1.87) and Nabi (+0.87). Last season SRH defended four scores of 151 or fewer. Stanlake (-1.03 is a potential weakness as the overseas pace bowler. On his day he can be brilliant but at his worst he has proven very hittable and struggled in the BBL. Death bowling - SRH are particularly brilliant in the death overs. Last season their death overs economy rate of 8.91 runs per over was comfortably the best in the league. Indian batting - Warner (projected batting impact +2.62) and Williamson (-0.11) are certain to start but with Dhawan traded to Delhi SRH are short on Indian batting. Yusuf (+0.74) is an experienced lower order option but Manish (-0.50) needs to justify his huge price tag after a poor season last year. Guptill (+0.11) and Bairstow (+0.31) provide back-up overseas options. Shankar (-0.18) contributes a negative impact with the bat in T20 but has shown potential in ODIs recently. Lower order hitting - Yusuf (projected batting impact +0.74) is a powerful hitter down the order but Shakib (-1.53) often being preferred ahead of Nabi (+0.95) for the all rounder spot robs SRH of a huge amount of batting firepower. Nabi’s bowling (+0.68) is worse than Shakib’s (+1.87) but not by enough to justify his exclusion. Greater utilisation of Rashid’s batting could help SRH protect against this potential problem with Hooda (-1.06) and Saha (-1.47) also unlikely to contribute much in the phase.